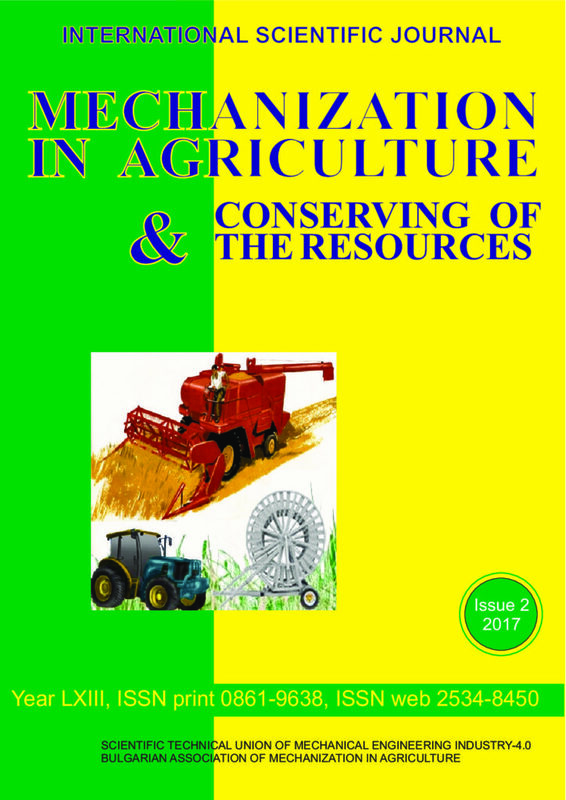 This paper presents the results of the laboratory and field research tests, carried out for the experimental installation of the stubble grain seed drill with working organs for separate application of seeds and fertilizers. The test conditions were determined in accordance with SST 20915. The evaluation of agrotechnical indicators was carried out in accordance with SST 31345. Maintaining of the combine harvesters in an efficient condition throughout the harvest season is an important task of technical service. The most important elements in the work of combine harvesters are their steering mechanisms, the performance of which must have a high degree of availability, especially of their hydraulic drives. The purpose of this study is to increase the operational reliability of the steering drives of the combine harvesters, based on the development of an improved method for diagnosing of their hydraulic drives. During the research, the methods of theoretical and experimental research were used, based on the theory of machine operation, hydraulics, as well as modern methods of experimental studies of hydraulic equipment. The data of the experimental studies were processed by statistical methods using a PC. Theoretically and experimentally, an improved method for diagnosing of the hydraulic drives has been developed with the aim to increase the technical readiness of combine harvesters and reduce the costs of their maintenance and repair. A new methodical approach and results of studies on the creation of a diagnostic system for the hydraulic drive of the combine harvester’s power steering have been developed. The works on creation of technique of calculation of the electric corona ionization for storage of products with juicy plant products are summarized. The necessity to determine the effect of recombination of ions on the performance of these devices is proved. The dependence of the concentration of ions from the ionizer uptime, productivity and the recombination coefficient was obtained. It was determined that when calculating performance electric corona ionization for processing of plant products with succulent tissues outside the corona ions recombination can be ignored. Elucidation of the role of recombination in the processing of such products in the inter electrode space further research. The mathematical description of the motion of particles of grain mixture in the chamber, air separator gravity under the action of a pulsating flow of air of variable speed. An trajectory of particles of different sizes. The resulting equations of motion of particles under the action of a pulsating flow of air to determine the dependence of the velocity of material in grain liquefied air layer of material on a number of factors: the geometric parameters of sieve openings, the angle of presentation, initial the kinematic mode material index kinematic mode sieves and sails share ratio. Theoretically reasonable technological possibilities of the proposed method of separation of grain by the action of air flow and impact on established technological performance parameters: air speed factor with regard to living sectional thickness of material entering the channel. Technology incompatibility in the sugar beet harvesting process is established. Beet tops removing by follower cutoff with the subsequent root crop heads cleaning is possible at speed no more than 1.5 m·s-1 whereas beet pullers operate at speeds of 1.2… 1.5 times are higher. At a cutting without copier of sugar beet tops a working speed makes more than 1.5 m·s-1, however losses of sugar-bearing plant material exceed agrotechnical requirements twice because of unreasonable height of a cut relative to soil surface. The differential equation of bow-shaped copier movement on a root crop head of sugar beet which is the main equation of functioning root crops heads cleaner is worked out. Components of the differential equation are defined and dependence of normal reaction on design parameters of root crop head cleaner is received. Conditions not of knocking-out of root crops are received and rational values of design parameters and operating modes of root crop head cleaner are proved. Водата участва във всички физиологични процеси и има изключително важно значение за растежа и развитието на растенията и при формиране на добивите. Поради настъпващите вариации в климата, изразяващи се проява на интензивни валежи, следвани от продължителни сушави периоди, устойчиво развитите на земеделските култури може да се постигне само при ефективно използване на водата. Разгледани са алтернативите за използване на водата, като са определени необходимите количества при различни начини на доставяне на водата. An estimation of streamflow transformation in rivers of Belarus under present conditions influenced by natural fluctuations of flow and anthropogenic impacts, has been performed. On the whole, no sizeable changes in the annual streamflow have been found. At the time of spring floods, an average decrease in the maximum annual discharge in the territory of Belarus is 43%, while the increase in peak summer-autumn and winter yields are 27% and 36 %, respectively. This paper aims by changes in field soil compaction in dependence on time and weather conditions, like current air temperature, current weather conditions, average monthly air temperature and average monthly rainfall. Experimental data were taken from 11th November to 10th March 2017 nearby České Budějovice, the Czech Republic. The soil compaction was measured by penetrometer up to 80 cm at thirty different places. The average temperature in November was 2.1 °C and in December was -0.9 °C, which are common temperatures in this season in the Czech Republic. Magnitudes of the compaction are almost similar up to the deepness of 30 cm, whereas the soil compaction grows significantly from 20 cm of depth. There is a break-point at about 30 cm of deepness, where the magnitude of soil compaction stops growing and starts falling. The soil compaction from 30 cm and deeper decreased according to elapsed time after tilth. Interpretation of this data could assist in deciding on agricultural machinery passes over plowed soil with minimal undesirable compaction of the subsoil. Problematic issues of tillage on slopes are distinguished and methodological aspects of theoretical analysis and experimental researches and production testing of tillage and sowing machinery under the given conditions, in recognition of preservation of soil fertility, are represented. It is considered that sloping lands can be terraced to reduce water erosion of soil, but it is not always expedient to apply this anti-erosion measure, especially on slopes with low steepness, where the usage of special tools for soil-protective nonmoldboard tillage is preferable. The theoretical background to make calculation of sowing machines that are engineered for the system of precise/specific/accurate farming in fields with a complex terrain is presented.